I was so, so excited when this book by the Economides family arrived. After all, their subscription newsletter and many children make them seem like an updated Dacyzn story. Perhaps that was my mistake--setting the bar too high. The book is enjoyable, with many sound money tips hearkening back to Crown Financial Ministries and Dave Ramsey. I just didn't love it like my Tightwad Gazette. I think there are certainly families who are cheaper than the Economides, only they aren't teaching workshops at homeschool conventions. Money and kids: the Economides use a point system similar to ours, only our preschooler spends points instead of actual money. Saving on food: both parents double-team the grocery in a once-a-month mega-shop--with coupons. No recipes or in-depth information about once-a-month cooking, though. Family travel: The Economides detail an 18-day trip to Washington DC, dollar by dollar, down to buying a crockpot in a thrift store upon arrival. By all means, check this book out from the library! Practiced budgeters might think twice before subscribing to a newsletter, though, especially since we can glean similar information online for free. You are 100% correct about this book. I think most of the things they are 'teaching for profit' can be had for free from the library or the internet. I did not see anything new in the book at all. Their web site is all about selling their book and newsletter. 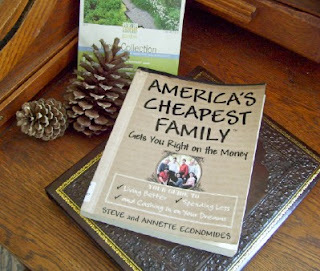 I guess if you are pea green about thrift and frugal living you might learn something from this book or the newsletters, but most people would be better to spend their money else where. I read an article on this family a couple of years ago in Budget Living magazine. It was an interesting article. I didn't know they'd written a book. Thanks for the review! Sounds like one to potentially pass on. Thanks for the review. I haven't seen the book, but I did see the Budget Living interview. It seemed even there that they wanted to sell their book. I don't really like budget websites or books that try to sell you something. I think when it is truely a part of your *being* you just pass it on so others can benefit and learn. To me those articles/websites/books are the best. I also prefer cheap that isn't at cost to other people, you know where others pick up the cost for your cheapness. Thanks for that. I devoured the Tightwad books, so thought that would make it into my library bag. I think I've got the frugality down though. I did not like it as much as I thought I would either! I would take Tightwad over them any day. I don't think there's anything wrong with selling their expertise--it does take huge time and effort to counsel others and compile a book. However, if you're selling to thrifty folk, it had better be a good value! That is too funny: I *just* read this! I also had a similar reaction since I only learned two new things. I have since deleted this from my Amazon Wish List.